It was very wise of you to decide to return. (…) There was something inappropriate in your absence. — Max Frei, ‘The Volunteers of Eternity’. 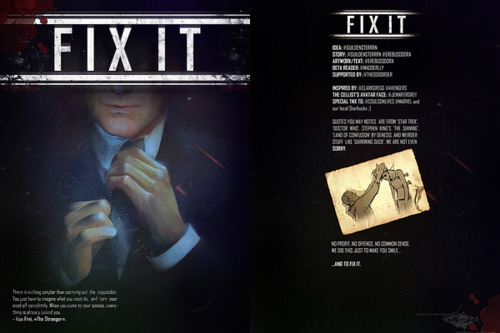 FIX-IT (fandom term, adj.) — a descriptive epithet for a fan fiction, that fixes something in original, canon version of mentioned events. E.g., fiction can fix marriage, romantic notions, unreleased tension. COULSON EVENT (fact) — also known as Schrödinger Coulson; the only thing in Marvel’s The Avengers you can really spoil. DOUGHNUT (noun, specific) — also known as ‘donut’; a type of fried dough confectionery or dessert food. Symbolizes peaceful eternity in its sweetest form. Fondly associated with better side of Jörmungandr in some religions. Click here to get a .zip file with English version, Russian version, and few work-in-progress extras.